A Seoul cop, Tae-su (Korea's top action choreographer/stunt artist Jeong Du-hong), receives the shocking news that his childhood friend Wang-jae (a Ryoo Seung-wan regular, An Kil-gang), a retired wise guy, has been stabbed to death by a handful of punks. Tae-su goes back to his hometown, On-sung, to attend Wang-jae's funeral. He immediately smells a rat. The town is under the thumb of their old buddy Pil-ho (Lee Beom-soo, "Oh! Brothers," "Mr. Gam's Victory"), now a big shot gangster and involved in a citywide real estate development scheme. 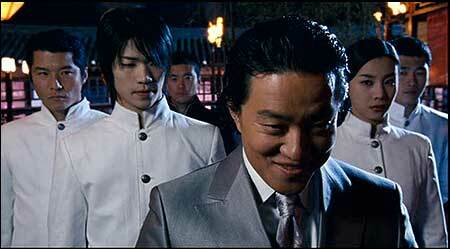 Tae-su reluctantly teams up with the short-tempered Seok-hwan (director Ryoo Seung-wan) to avenge Wang-jae's murder. Ryoo Seung-wan, one of the most talented Korean directors and an action film maven, hit the jackpot last time by branching out into the sports drama in "Crying Fist." For the latest endeavor, he consciously returned to his cinema geek roots and put together a self-consciously generic Asian action film evoking great classics of yesteryears. Even though lazy "Western" critics perpetually drag out Quentin Tarantino when referring to Ryoo's works, the superficial similarities of "City of Violence" to Tarantino's "Kill Bill" really result from both filmmakers drawing upon common sources: Shaw Brothers martial arts blockbusters, John Woo's HK film noir, classic "samurai" films and spaghetti Westerns with morose, twanging guitar scores. Other than that, Ryoo's sweaty, emotionally expansive Cinema of Pain is solidly rooted in the Korean cinematic tradition of '60s and '70s, flavoring the film's knowingly predictable narrative with pungent local color and able bodies spinning like whirligigs in jaw-dropping taekwondo moves. While capturing the action quick and dirty with deliberately grainy Super-16mm stock, Ryoo still manages to flex his creative muscles, most impressively with economical storytelling and visual panache. Only the over-use of slow motion photography slightly mars the sheer cinematic pleasure derived from his crazily inventive setups and mise en scenes. 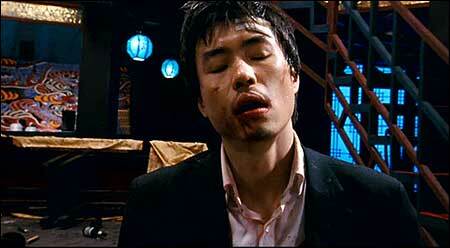 In terms of the characters, Ryoo casts himself in a somewhat ironic second-banana role, letting Jeong Du-hong (who is unfortunately a bit wooden) take the lead (Seokhwan is to Tae-su what Clint Eastwood is to Lee Van Cleef in "For a Few Dollars More") and generously yields the acting spotlight to Lee Beom-soo as the villain Pil-ho. As the curly-haired, wide-eyed, slightly ridiculous Pil-ho, whose monumental sense of inadequacy actually propels the film's narrative, Lee gives a flamboyant but entertaining performance. The film's extended climax, featuring four stunning-looking, white-clad bodyguards beating the bejesus out of our scrappy heroes and an audacious, Beat Takeshi-meets-Sam Peckinpah sequence in which they have to pass through a gauntlet comprised of about two dozen very sharp knives, is a marvel all right. But in terms of kinetic energy and chutzpah it is outdone by the mid-point chase sequence (inspired in part by Walter Hill's "Warriors"), in which Tae-su and Seok-hwan are pursued by dozens of teenage thugs, brandishing weapons ranging from baseball bats to hockey pucks and even employing capoeira-by-way-of-B-boy-dance moves as lethal weapons. During the Korean press screening, Ryoo stated that he pretty much said everything he wanted to say about the action film genre in "The City." (He sustained an almost permanently debilitating knee injury during the production, and had to nix the elaborate ideas regarding the climactic martial arts showdown) The film, while breaking no new ground, is a highly entertaining, compact little action film, with not an ounce of fat on its lean and mean body. It will be a pleasure to anticipate what this startlingly handsome, ridiculously talented, possibly the least sedentary young film director living on the Earth today will pull off next. Dragon Dynasty/Weinstein Company. NTSC. Dual Layer. Region 1. Video: Anamorphic Widescreen, 1.85:1. Audio: Korean (DTS, Dolby Digital 5.1), English. Subtitle: English, Spanish. Retail Price: $19.99. Released: Sept. 4, 2007. Weinstein brothers have set up a new DVD label, Dragon Dynasty, that exclusively caters to Asian (mostly Hong Kong) action films, both classic and new titles. 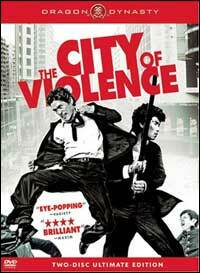 "City of Violence" receives a surprisingly decent treatment from the label. Alas, the transfer is not perfect, replicating the problems from CJ Entertainment's Region 3 DVD, retaining a high-contrast, smudgy look familiar from Korean DVDs. Black levels frequently suffer, and skin tones sometimes slide toward orange. It must be pointed out that the film's grainy, cheap-looking visuals are Ryoo's deliberate choice and not due to faulty transfer. The audio selections are considerably better. Both 5.0 and DTS tracks tend to bunch up dialogues to the front speakers but overall nicely separate among various bone-crunching sound effects, grunts and yells and other atmospheric sounds. Ryoo Seung-wan's films have always had excellent English subtitles and "City" is no exception: free from typos, obvious grammatical errors and nicely restrained in terms of translating macho insults and cusswords. All of the rather generous Region 3 supplements have been imported to this two-disc special edition. Disc 1 contains Ryoo Seung-wan's wall-to-wall commentary track and a blooper reel, showing Jeong Du-hong breaking out in laughter over and over, and Ryoo's priceless reaction as he accidentally threw a prop knife up in the air. Disc 2 has an exhaustive series of featurettes that cover all aspects of the production, from initial conception to storyboarding to the trials and tribulations of martial arts choreography. The best featurette is "A Walk on the Wild Side," (presented in an excellent widescreen format), which focuses on the action/stunt director and star Jeong Du-hong and his Seoul Action School, a stunt company, featuring interviews with the assistant martial arts director Jeong Jang-hyun and the head-turning beauty Kim Hyo-sun, who played one of the White-Clad Gang of Four. They speak with disarming candor about the difficulties of maintaining a stunt company in a country (this might come as a surprise to some non-Koreans) that Jeong believes does not appreciate the action genre at all. Their commitment, passion and pride regarding the action/martial arts filmmaking in Korea are palpably communicated to the viewers. They don't mince words, either: Jeong Jang-hyun at one point bluntly states that those who believe "City" ripped off "Kill Bill" are simply idiots. Other supplements include deleted scenes with an optional director's commentary, trailers and photo gallery. All supplements are thankfully subtitled in English, whose quality ranges from good to excellent. Dragon Dynasty's "City of Violence" DVD does not exactly surmount the problems inherent in the Region 3 version, but with high-quality English subtitles and a generous distribution of special features over the two discs, it is a satisfactory release nonetheless. It is hoped that the Weinsteins (or somebody) will release Ryoo's (unjustly vilified) "Arahan" stateside soon as well.